Several years ago, a well-known political leader in ophthalmology and I began a dialog about interprofessional relations and the future of our two professions. The discussions continued for well over a year with little progress. One day, he called and posed an interesting question: What if ophthalmology created a pathway for more medically focused ODs to gain full medical and limited surgical privileges? The process would be controlled by ophthalmology, would be limited to a small number of ODs with proven track records in medical eye care, and would involve several years of additional training. He wanted to know what I thought of the idea. I considered the proposal and quickly rejected it. I told him that it would never fly. Optometry was an independent profession, and, ultimately, it would determine its own fate. I have thought about that conversation many times over the intervening years, but it’s only been recently that I’ve seen some merit in the basic concept. It’s become increasingly apparent that some of us, even recent grads from quality programs with excellent training, focus primarily and sometimes exclusively on refractive care. While I have no issue with this (other than thinking this career direction may not be sustainable in the long run), I’ve also encountered colleagues who have successfully gravitated toward medical and even surgical care in states that permit it. 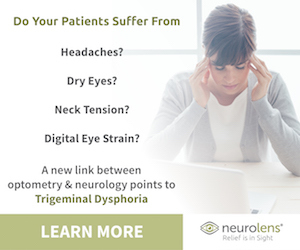 Salzmann's nodular degeneration (SND) typically occurs in patients who are female, 50 to 60 years old, and have a history of corneal inflammation and irritation. Multiple case reports have documented associations between SND and trachoma, viral infections, trauma, contact lens wear, corneal surgeries and corneal exposure. The authors described a patient with bilateral SND confirmed by anterior segment optical coherence tomography (OCT) imaging in the context of thyroid eye disease (TED) and history of LASIK. Treatment involved propylthiouracil (PTU), artificial tear use, loteprednol etabonate ophthalmic gel, eyelid taping and selenium supplementation and prospective superficial keratectomy with diamond burr polish. SOURCE: Yang MC, Al-Hashimi S, Rootman DB. Salzmann's nodular degeneration of cornea associated with thyroid eye disease. Orbit. 2018; Aug 27:1-3. [Epub ahead of print]. Axial length and corneal radius (CR) were measured with an IOLMaster 500, and daily life activities and demographic characteristics were obtained by questionnaire to identify risk factors for axial length (AL) elongation and incident school myopia. A total of 4,734 children were examined at six and nine years of age from the Generation R Study in Rotterdam, The Netherlands. A total of 3,362 (71%) were eligible for cycloplegic refractive error measurements. Linear regression models on AL elongation were used to create a risk score based on the regression coefficients resulting from environmental and ocular factors. The predictive value of the prediction score for myopia (≤ -0.5D) was estimated using receiver operating characteristic curves. To test if regression coefficients differed for baseline AL-to-CR ratio, interaction terms were calculated with baseline AL-to-CR ratio and environmental factors. From six to nine years of age, average AL elongation was 0.21mm/year ± 0.009mm/year and myopia developed in 223 of 2,136 children (10.4%), leading to a myopia prevalence at nine years of age of 12.0%. Seven parameters were associated independently with faster AL elongation: parental myopia, one or more books read per week, time spent reading, no participation in sports, non-European ethnicity, less time spent outdoors, and baseline AL-to-CR ratio. The discriminative accuracy for incident myopia based on these risk factors was 0.78. Axial length-to-CR ratio at baseline showed statistically significant interaction with number of books read per week and parental myopia. Almost all predictors showed the highest association with AL elongation in the highest quartile of AL-to-CR ratio; incidental myopia in this group was 24% (124/513). Researchers concluded that determination of a risk score could help to identify school children at high risk of myopia. They wrote that their findings suggested that behavioral changes could offer protection particularly in these children. These 123 SS patients presented with a large variation in their symptoms and signs. Symptoms of dryness and corneal fluorescein staining were the most commonly recorded presentations. There was a great deal of inconsistency in dry eye protocols among offices. Future prospective research with standardized testing will contribute to understanding the best dry eye protocols for SS patients. SOURCE: Tideman JWL, Polling JR, Jaddoe VWV, et al. Environmental risk factors can reduce axial length elongation and myopia incidence in 6- to 9-Year-Old children. Ophthalmology. 2018; Aug 23. [Epub ahead of print]. Three young adult male rhesus macaques were briefly anesthetized with ketamine and dexmedetomidine, and antibiotic ointment was placed in both eyes to determine the magnitude of IOP elevation associated with eye rubbing. The anesthetic was immediately reversed with atipamezole, and the animals quickly recovered. IOP was continuously recorded at 500 measurements per second during the experiment using a validated implantable wireless telemetry system; high-definition video was recorded while the nonhuman primates (NHPs) rubbed their eyes to remove the ointment, and rubbing events were marked in the IOP data. The experiment was repeated four times in each NHP, with numerous eye rubs recorded for each session; data were marked, and the IOP elevation magnitudes were analyzed using NOTOCORD-hem software. The main outcome measure included IOP elevation above baseline IOP due to eye rubbing. IOP increased as much as 310mm Hg due to eye rubbing. The largest IOP elevations were associated with rubbing the eye and orbit with the back of the hand or wrist, rather than the fingers or knuckle. Eye rubs elicited mean IOP elevations of ~80mm Hg to150mm Hg above baseline for three to four seconds, with peak IOP elevations reaching 205mm Hg to 310mm Hg, depending on the individual NHP and eye. Rubbing the eyes caused momentary IOP elevations that averaged 109mm Hg above baseline IOP and could exceed 300mm Hg above baseline IOP in NHP eyes. SOURCE: Turner DC, Girkin CA, Downs JC. The magnitude of iop elevation associated with eye rubbing. ophthalmology. 2018; Aug 25. [Epub ahead of print]. New England College of Optometry announced that Donald R. Korb, OD, an alumnus, joined the faculty as an adjunct professor. Dr. Korb is recognized as an international authority on dry eye, having named and described meibomian gland dysfunction, and having co-invented two leading dry eye products currently marketed. Dr. Korb has more than 60 patents and 110 publications in referred scientific journals. He has discovered and named three ocular conditions and has received over 40 major honors, and was elected to two halls of fame and awarded three honorary degrees. Read more. Bausch + Lomb’s expanded parameters for Biotrue OneDay for Astigmatism daily disposable contact lenses extend the full power range to +4.00D to -9.00D, in three cylinder powers of -0.75, -1.25 and -1.75, with additional parameters in a -2.25 cylinder. With this extended range, eye care professionals can offer more astigmatic patients a daily disposable contact lens that provides continued comfort and moisture retention. Similar to the other products in the brand family, Biotrue OneDay for Astigmatism contact lenses have a patented dehydration barrier designed to maintain nearly 100% of moisture for a full 16 hours. In addition, they offer a peri-ballast design featuring a tapered edge to limit lid interaction and spherical aberration control to help reduce halos and glare, particularly in low light. Read more. IRIDEX announced the introduction of its updated TruFocus LIO Premiere laser accessory, following FDA 510(k) review and clearance. The light combination and reflection viewing system used with IRIDEX retina laser systems is worn on the physician’s head. It combines a laser treatment beam from an IRIDEX laser source with the illumination beam of a binocular indirect ophthalmoscope into a mixed optical beam used by a physician with a handheld ophthalmic examination lens to enter a patient’s pupil, and view and treat a patient’s retina. It provides a portable alternative to patients who cannot be examined or treated with a fixed slit-lamp adapter. Read more. The American Academy of Optometry held its inaugural program, The Research Academy, in Columbus, Ohio, July 17 to 19. The Academy was designed to help optometry faculty attendees develop ideas that will result in extramural funding for basic and patient-oriented research in optometry and vision science. The program included a video presentation by Dr. Israel Goldberg of Health Research Associates and mock National Institutes of Health-style study section with experienced reviewers so that attendees could experience how submitted grants are evaluated. Learn more. In addition, the Academy announced the recipients of the 2018 Student Travel Fellowship Awards. The travel fellowships will allow students to attend Academy 2018 San Antonio (Nov. 7 to 10). See the recipients.